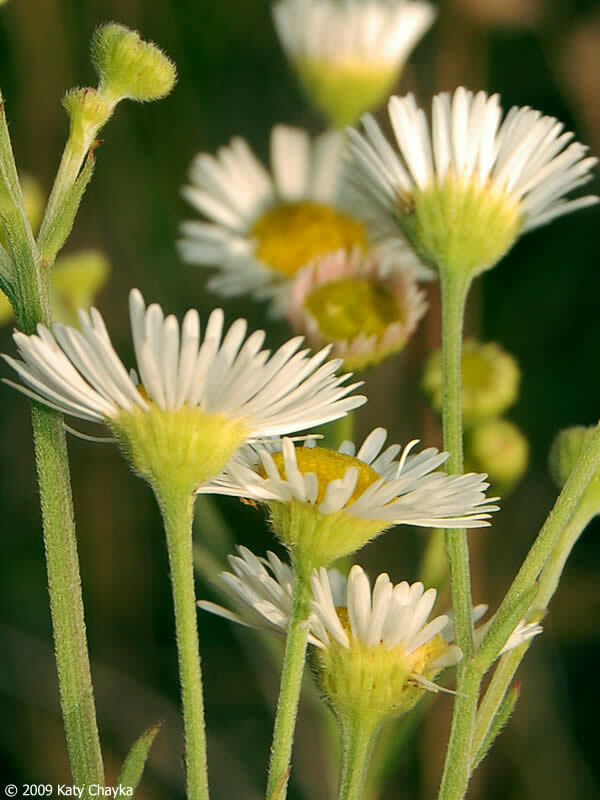 Erigeron strigosus. Copyright © 2003 Peter M. Dziuk.www.minnesotawildflowrs.info. (Accessed 4/2014). Erigeron strigosus is an annual, occasionally biennial herb, 30-70 cm tall, somewhat hairy, roots fibrous, occasionally colonial from rhizomes. Erigeron strigosus flowering plant. 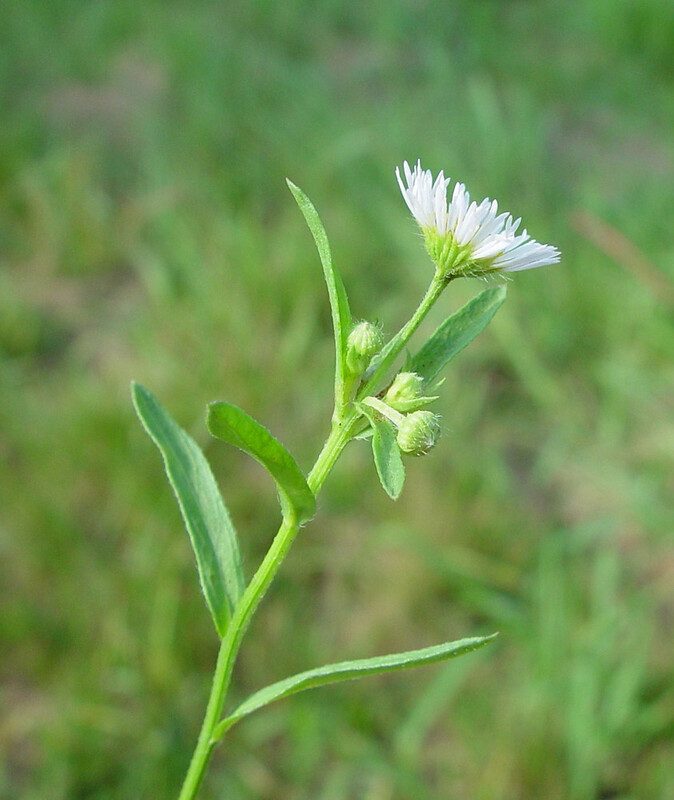 Erigeron strigosus. By Arthur Haines. Copyright © 2018. New England Wild Flower Society. gobotany.newenglandwild.org (Accessed 8/2018). Leaves sparse, basal leaves widest above middle, 3–15 cm long 5–2 cm wide, margin entire or toothed, stem leaves narrower, toothless (otherwise very similar to E. annuus). Flowers in radiate heads, ray flowers white (sometimes pinkish) 50-100, 0.4-0.6 cm long, to 0.1 cm wide, sometimes very short, disk 0.5-1.2 cm wide, flowers yellow, ca 0.2 cm long; self-fertile (agamospermy), (Mulligan and Kevan 1973). 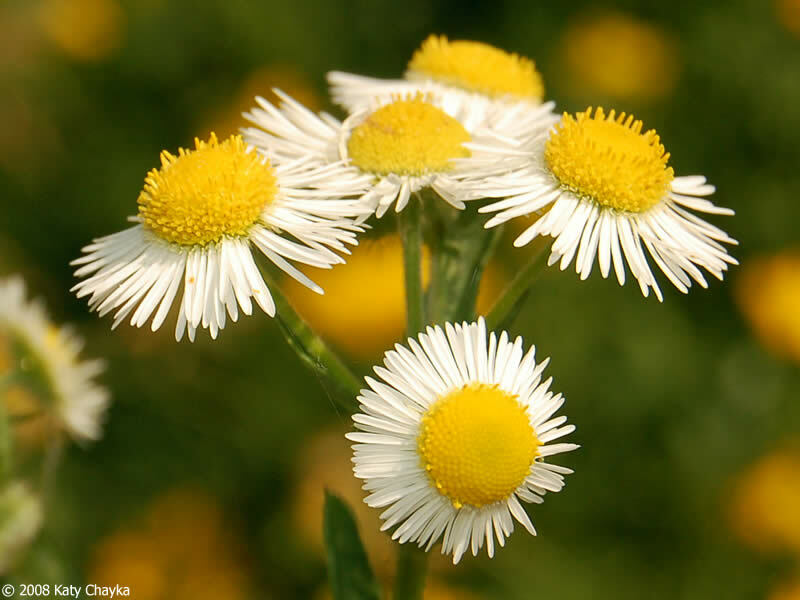 Erigeron strigosus (prairie-fleabane) flower heads. © 2008 Katy Chayka. Minnesota Wildflowers. minnesotawildflowers.info (Accessed 8/2018). Fruit dry, 1-seeded, ca 0.1 cm long, with grayish plume; wind dispersed. 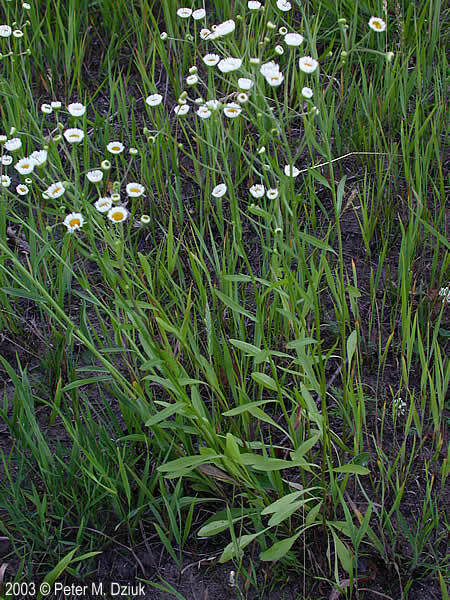 Erigeron strigosus (prairie-fleabane) backs of flower heads. © 2009 Katy Chayka. Minnesota Wildflowers. minnesotawildflowers.info (Accessed 8/2018). Habitat: Open disturbed areas, roadsides, soil pH 4.8-7.2 (USDA, NRCS 1993+). Notes: Much like E. annuus but much less common, at least in NYC.